IKV has received an award for its internationalisation initiative "Global network for innovative plastic materials and processes". Professor Dr. Johanna Wanka, Germany’s Minister of Education and Research, presented the award on June 30, 2015, in Berlin during the BMBF’s 3rd International Cluster Conference. 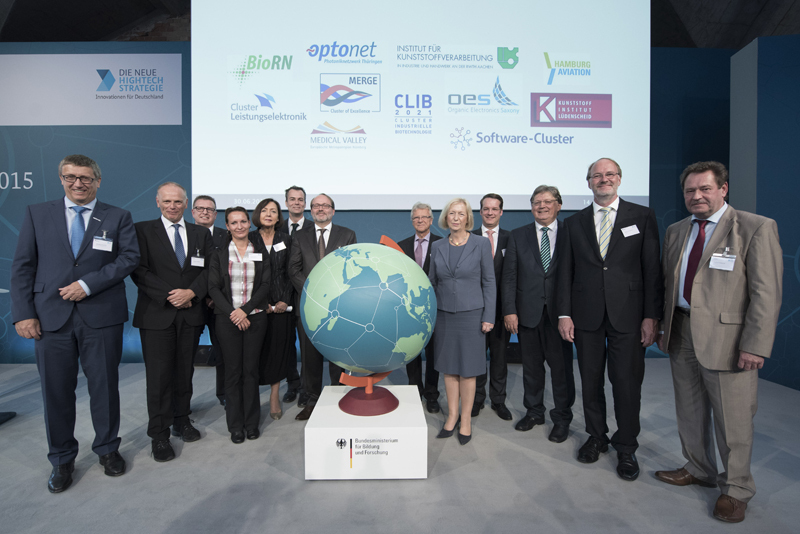 Presentation of the award to successful applications for the BMBF initiative "Internationalisation of leading-edge clusters, forward-looking projects, and comparable networks" at the 3rd International Cluster Conference of the BMBF in Berlin (photo: BMBF). The Institute of Plastics Processing (IKV) in Industry and the Skilled Crafts at RWTH Aachen University has received an award for its internationalisation initiative "Global network for innovative plastic materials and processes". Professor Dr. Johanna Wanka, Germany’s Minister of Education and Research, presented the award on June 30, 2015, in Berlin during the BMBF’s 3rd International Cluster Conference. Prior to that, the IKV initiative had been examined by an independent committee of experts and recommended for funding by the Federal Ministry of Education and Research, BMBF. Worldwide, Germany is in second place in the export of research-intensive goods, ahead of the United States and Japan but behind China. To be able to retain this outstanding position, the German government is strengthening the strategic internationalisation of top-level research. As part of the newly launched initiative "Internationalisation of leading-edge clusters, forward-looking projects and comparable networks", the German Ministry of Research will, with immediate effect, support projects from Germany for the international networking of particularly innovative regions with up to four million euros in each case. "We want Germany to remain a world leader in the export of high-tech goods. For this reason, we support the global networking of science and industry. The new initiative will help companies, universities and research institutes to participate in international innovation processes and to be actively involved in designing them," said the Federal Research Minister in Berlin. The internationalisation of clusters and networks is part of the new high-tech strategy with which the German government aims to turn ideas into innovations and establish links between science and industry, research and society. At the same time, it is part of the BMBF's "International cooperation" action plan. IKV took part in the BMBF competition because it aims to further expand its internationalisation strategy. Apart from the globally oriented networking of the mainly small and medium-sized cluster members in global research projects, it also includes greater intercultural training of upcoming specialists in the plastics segment. "IKV, as the oldest cluster of the plastics scene, is strengthening its international activities and will thus accompany its 250 member companies on the road to greater internationalisation. We are delighted that the BMBF considers these activities to be so valuable and supports them," said Professor Christian Hopmann, head of IKV, commenting on the award and the generous backing of the BMBF.